31/05/2018 – How do you create a touristic landmark that catches people’s attention whilst fluidly merging with the surroundings? 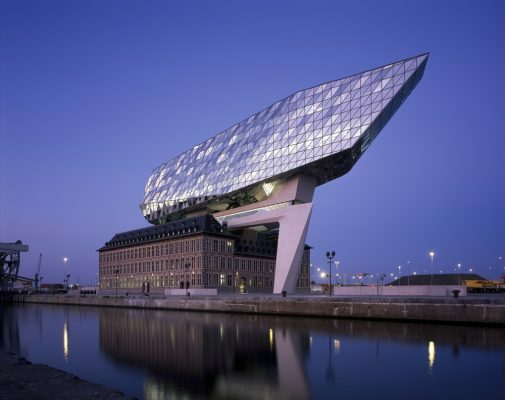 Connecting landscape and landmark formed a basis for the winning design by NEXT architects for the Hoge Blekker, a watchtower on the Belgian coast. The competition was run by the Municipality of Koksijde, the Province of West-Vlaanderen and Westtoer to emphasise the experience of the landscape in the touristic regions. 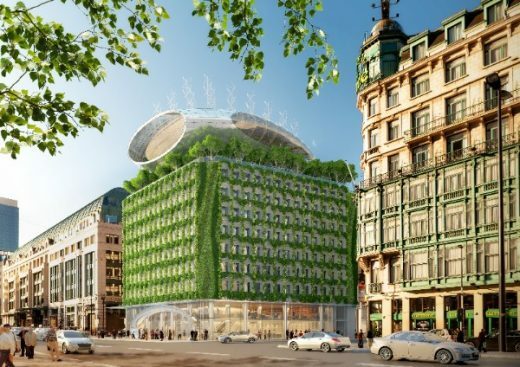 Hoge Blekker is one of the watchtowers that will be realised as part of the programme Horizon 2025. 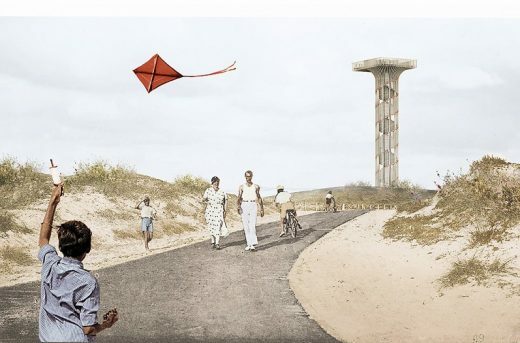 The watchtower gets its name from the Hoge Blekker in Koksijde, the highest dune of the Belgian coast. A helix-shaped staircase leads visitors up to a platform at a height of 20 meters to experience the view of the horizon. 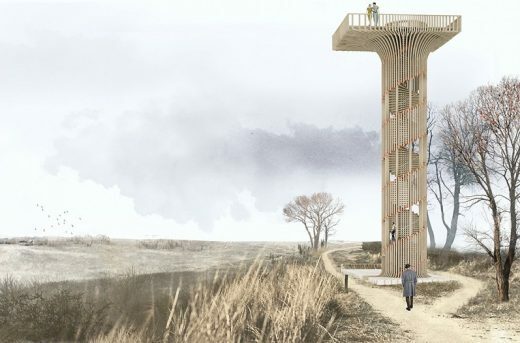 The way up is closed by the wooden lamellae, which partially shroud the view on the landscape; on the top of the tower the view can be enjoyed in its full glory. This play between open and closed, extrovert and introvert, reinforces the experience of the landscape and of the tower itself. 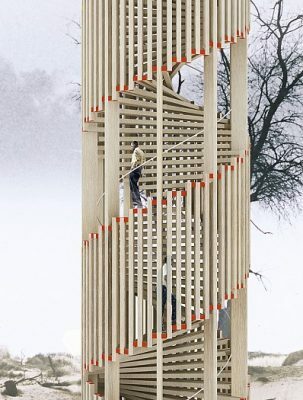 This watchtower fits within a unique series of landmarks and follies by NEXT architects. 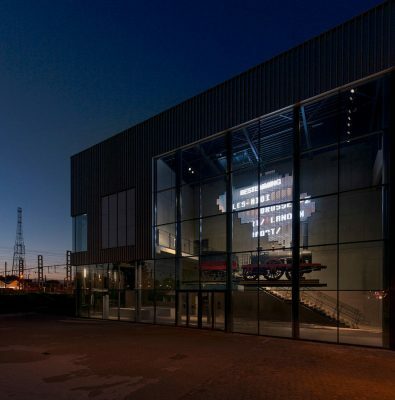 Amongst these are: the award-winning Elastic Perspective in Barendrecht, nearby Rotterdam, which is entirely made out of weathering steel, and the mysterious It Goddeloas Fiersicht in the Northern Dutch Province of Friesland, made of concrete blocks. The Hoge Blekker is made almost entirely of slender wooden beams that together form a constructive unit. 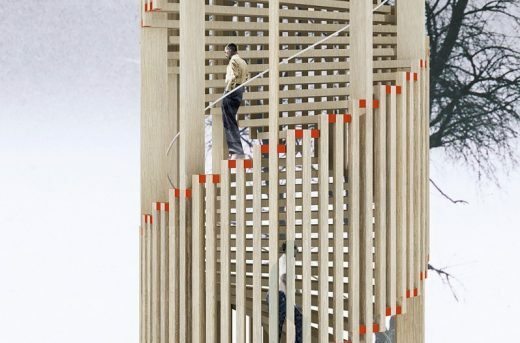 For the tower’s construction NEXT is collaborating with Ingenieurbüro Miebach, a German engineering office that specialises in the use of wood as a construction material. The tensions between landscape and landmark, between integrated and autonomous, between movement and stillness, and between past and present are made visible in the Hoge Blekker watchtower. 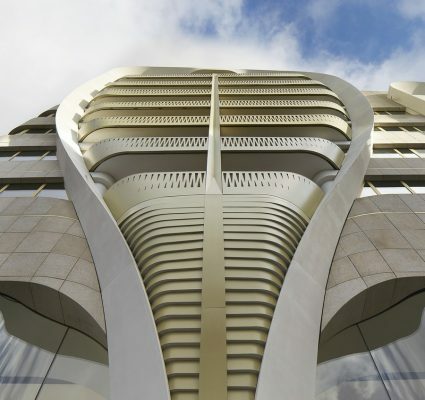 The design builds upon the history of the place, the identity and experience of the dunes. Yesterday, the design team came together with the Major for the first time in Koksijde. The watchtower is expected to be realised in 2019.